You know how sometimes you miss your childhood so terribly, you wish you could just go back in time? Well, the time machine is here and it is time to go back to the 90s. We’re talking of the time when there were plenty of films you could watch with your family without having to worry about that awkward moment when a love making scene started playing. The 90s really was the Golden era of comedy in Bollywood. Here are 20 of the best comedy films from the 90s you still won’t mind watching again! You cannot talk of comedy films and not worship this masterpiece by Rajkumar Santoshi. Probably one of the finest comedies Bollywood has ever seen, this comedy of errors is every Indian’s favourite! Even though the film technically belongs to the 2000s, we just couldn’t get ourselves to make do without this cult classic because, ‘yeh baburao ka ishtyle hai’. You can never watch this one too many times. Bollywood, we’re still waiting for a comic character as iconic as Baburao! If one Govinda wasn’t enough, this one has him playing a double role! A must watch if you’re fan of the 90s style of comedy. This comedy drama about a man and his deceased sister’s prankster kids is probably the best thing we ever saw during our childhoods. The egg fight in the end will leave you all nostalgic about the good old 90s! Whether or not you find a man cross dressing as a woman funny, this one will definitely tickle your funny bone. With ‘Chachi 420’, Kamal Hasan became every kid’s favourite! Govinda in a double role, Chunky Pandey in his goofiest form and a freaking monkey – there’s no way you won’t crack up watching this! Govind, the mentally challenged Bunny, Anil Kapoor as Raja, the conman play the battle of wits to woo Neha (Juhi Chawla), the woman of their dreams over a series of uproarious events. Do you remember whom Neha finally chooses? What happens when Govinda and Karishma come together for a movie with a crazy plot? A laugh riot, just what this film was. A special mention to Shakti Kapoor for giving us the iconic Nandu! And when Raveena and Govinda got together for the film, even the title track was hilarious. That’s not even half as funny as the film, by the way! Think ghosts are scary? Chamatkar was about a man fed up of life befriending a ghost he finds in a graveyard and it is as heartwarming as it is funny. A son of a rich businessman disguises himself as a servant to win over his girlfriend’s family in a serious of hilarious events. We’re sure you still remember dancing on its songs, especially the title track! If there was one movie about adultery that we could watch with our parents without any hesitation, it was this one! This one had a conman (Sanjay Dutt) posing as an NRI relative into a rich household but falls head over heels with their daughter Urmila Matondkar. The film may have a romantic plot to it but man, it’s funny! 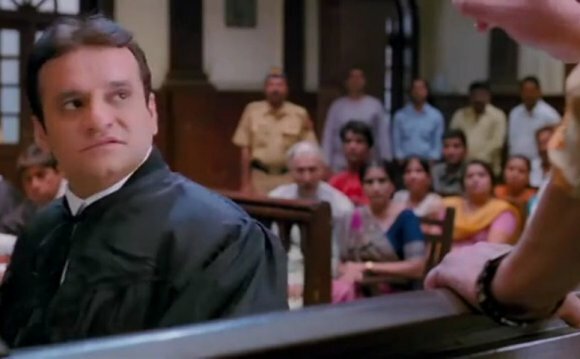 The most WTF story in the history of Bollywood, but also one of the funniest ever, this one’s probably Govinda’s biggest hit ever! Ting ding ding ding ding. Tin ding ding ding ding ding. Ring a bell? By the end of the 90s, SRK gave us this epic film, Badshah. It may not have been the best comedy ever but it definitely did make people laugh! And, here we come to probably the most WTF film in Bollywood ever, which is so bad it is actually good. If you haven’t watched this unintentionally hilarious masterpiece by Kanti Shah, stop what you’re doing and watch it now! Dus Lakh is a Bollywood Comedy movie released in 1966. It had music by Ravi & the starcast included Om Prakash, Sanjay Khan, Babita, Manorama, Helen, Pran, Ramesh Deo, Seema, Neetu Singh & others. Gujarati Comedy Group is a comedy group in Leicestershire, United Kingdom, that performs exclusively in the Gujarati language. As such it is the only one of its kind.